My first smartphone was a Verizon Droid-branded device. I’ve nothing but fond memories about my time with it. Motorola is now exclusively making Droid-branded phones for Verizon in the U.S. (selling them under different names overseas), and they’ve become yet another living example of how much control the carriers have over us as users. The Droid Turbo 2 is a wonderful phone. Actually, almost every phone Motorola has put out this year has been impressive, and this one is even more so because of its long-lasting battery life and durable chassis. But the Droid branding behind it feels outdated. What does that even mean anymore? That you’re buying a phone with Verizon’s applications that you can’t remove? I’m not convinced that the Droid Turbo 2 is worth the extra $200 or so it costs over its predecessor, the Moto X Pure edition. The Droid Turbo 2 is, essentially, a supercharged, souped-up version of the cheaper Moto X Pure. In the rest of the world, it is sold as the Moto X Force, direct through Motorola without carrier interference. I noticed that a few reviewers around the web were not particularly keen on the design of the device, but I’ve never known the Droid series to sport anything but a bloated industrial aesthetic. Still, if I walked into a Verizon store and I saw one of these devices laying out on one of the demonstration tables, I probably wouldn’t gravitate towards it. At the very least, this year’s Turbo 2 comes in various colors, so if you hate the bland white-and-silver color combination featured here, you can customize your own Droid Turbo 2 with Motorola’s Moto Maker. Remember when Verizon would emblazon every phone it sold with its logo? Apparently it still does so in some cases. The Turbo 2 features Verizon’s logo on the front side, right where your chin rests when you’re talking on the phone. Unfortunately, you don’t get a discount for advertising the carrier (like it needs it), and the Turbo 2 is still a whopping $624 off contract. A closer look at the Droid Turbo 2’s patterned backside. In an effort to justify its price tag, the Turbo 2 offers both a water resistant shell and a shatterproof display, which Motorola achieved by sandwiching the OLED display between four layers of protective glass, plastic, and aluminum. I did not try throwing this phone off of a three story building to test its durability, but Gizmodo dropped it on a concrete floor over 70 times and it was still looking pretty good. Conversely, Android Centralexperienced screen shattering on its first drop, though Motorola was quick to replace the unit and even claimed the damage as an anomaly. I threw the Turbo 2 around my backyard: at a tree, on the concrete floor. The display was fine, but the rest of the chassis got scuffed up. It’s the display that’s the important part, though, because that’s what keeps you using your phone. If you have a habit of dropping your phone on the ground, repeatedly, then you want a smartphone that can handle it. I’d rather drop the Turbo 2 than a Samsung Galaxy S6 Edge—which I dropped over Thanksgiving weekend, and it did not fare as well. As for the Droid Turbo 2’s Quad HD display, its color profiles are a bit too saturated for my liking. The display is also too dim; it’s no fun trying to turn up the brightness on this phone when you’re outside in direct sunlight. According to our benchmarks, the Droid Turbo 2 is one of the more powerful Android smartphones available. But does that really matter if the phone is riddled with bloatware and extra applications that Verizon has forced on its customers? 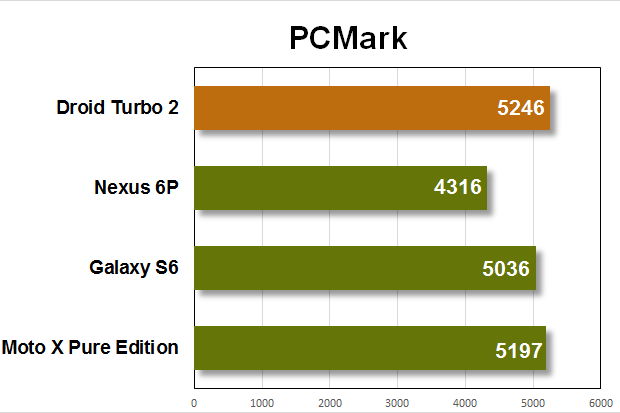 In PCMark, which tests for typical smartphone activities like browsing the web and editing video, the Droid Turbo 2 performed not much better than the Moto X Pure Edition with a Snapdragon 808. 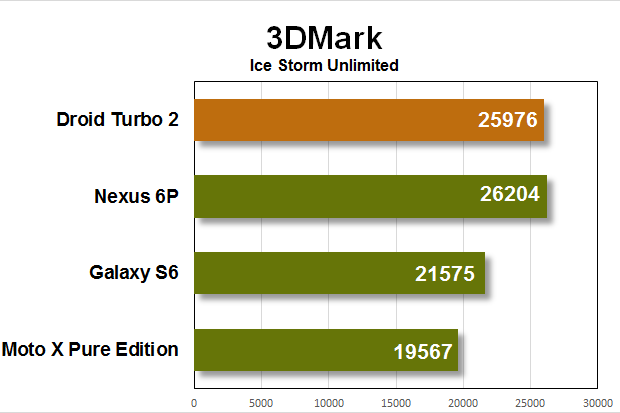 In 3DMark, the Turbo 2’s graphics performance was on par with the Nexus 6P—which makes sense, considering they run the same SoC. Let’s take a look at the benchmarks first: the Droid Turbo 2’s 2GHz Snapdragon 810 processor and 3GB of RAM performed on par with the Huawei-made Nexus 6P, which has the same specs. Its interface is overall speedy and responsive, and startup doesn’t take very long. There were some instances of lag, particularly when I was in a bad coverage area or my router was acting up, but otherwise everything ran smoothly on the Turbo 2. However, I can see the user experience turning sour after a period of time breaking in the Turbo 2. I typically wait until the end of the review to discuss the software bundled with each device, but this is one of those situations where the carrier is using an exclusive product to hawk it’s pointless bloatware, and it’s not okay. The Droid Turbo 2 comes with a tweaked version of stock Android 5.1.1 out of the box, and it’s preloaded with so many applications, including Verizon’s visual voicemail, cloud backup, messaging, and maps applications, as well as NFL Mobile, all of which you cannot delete off the device. The phone also comes bundled with games like Sugar Smash, Empire, and Game of War. Those apps are removable, but the last time I saw aphone with that much extra software, I was getting a serious discount on the price. You’ll also have access to Motorola’s software goodies like Moto Display, which lets you glance at the time and notifications without turning on the screen, as well as Moto Voice, which enables the device’s always-on listening capabilities. I’ve been living without these features just fine, and though I appreciate Motorola’s insistence on adding a bit more value to its devices, it’s hard to ignore all the Verizon applications clogging up the phone. This practice really has to stop. If you’re looking for a phone with the longest battery life, the Droid Turbo 2 is worth your consideration—bloat and all. 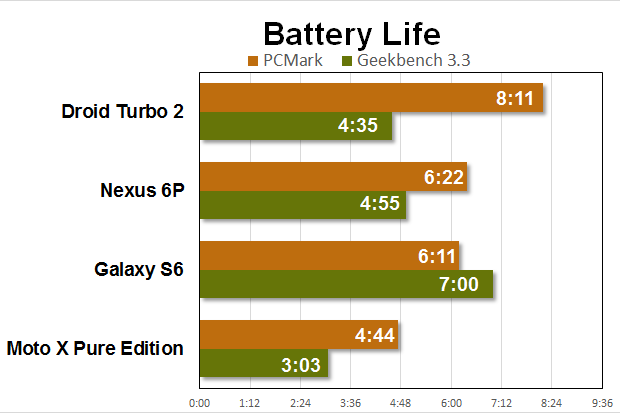 Its 3760mAh battery pack lasted a whopping hour and a half longer than the Moto X Pure Edition GeekBench battery test, and four hours longer in our PCMark battery test. The Turbo 2 did really well on standby, too, and lasted through an entire weekend of mixed usage without requiring a charge. When the phone does eventually cry out to be plugged in, the Turbo 2’s “Turbo Charge” feature is ridiculously fast—Motorola advertises that the phone can charge enough battery power to last 13 hours in just 15 minutes. I didn’t directly test this claim, but it’s nice seeing other manufacturers following in Samsung’s footsteps with faster charging capabilities. The Turbo 2 offers Qi-compatible wireless charging, too. With plenty of light, the Droid Turbo’s 21-megapixel camera soars. But when the light is low, I’d rather bring with me another phone more prepared for the task. It took Motorola a bit of time—several years, in fact—to deliver a quality camera experience in its Android phones. I’d like to think that every manufacturer decided to kick it into gear this year and get their phones packed with decent cameras. There’s too much of life to be enjoyed, and no one likes to go on without a camera to capture those memories. The Droid Turbo 2 features the same Sony-manufactured 21-megapixel rear camera with an f/2.0 aperture lens as the Moto X Pure Edition. It’s a capable camera phone when there’s plenty of light out, but it’s not the best nighttime photo companion. I took it out with me to participate in my small town’s Christmas tree lighting ceremony and I’m a bit disappointed I didn’t think to bring a backup camera—like the LG V10, with full manual controls. The nighttime photos I took with the Turbo 2 were a little blasé for my liking—or for sharing with the Internet. Moto’s camera app is too barebones and too annoying to use. 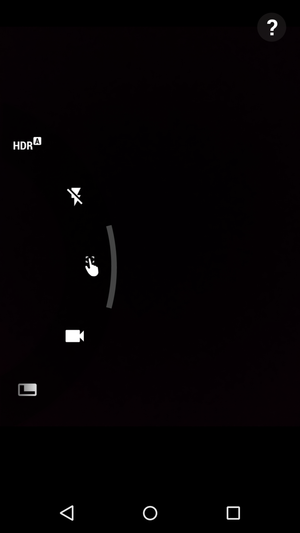 Also, I absolutely abhor the interface for Motorola’s camera app. First off, it’s too oversimplified, and I like to have a dedicated shutter button rather than tapping on the screen to shoot a photo. Second, by default the Motorola camera app shoots in 16:9 at 16-megapixels, which I didn’t realize until I had done a little digging in the menu. What’s the point of advertising 21-megapixels if it’s not even on by default? I anticipate that Verizon will sell plenty of Droid Turbo 2s because, rather than steer customers towards a bloat free, simple Android experience, they’ll point them towards a phone like this that puts its apps and services front and center. That’s a problem for Motorola: it allows Verizon to control the marketing for its most powerful device rather than sticking with its mantra of keeping it simple, customizable, and unlocked. By holding on to the Droid branding, Motorola is exhibiting a bit of a identity crisis. Why bother selling any of your phones unlocked online if your most impressive device is tethered to Big Red? To get Verizon more customers? It doesn’t need that. The Droid Turbo 2 is a fantastic device, but I’d caution you against it out of sheer principle—and all the software maintenance you’ll have to do before you can use the device, like deleting applications and disabling Verizon’s bloatware. And if I can’t convince you to stick it to the man, then I suggest you wait until the phone is on sale before Verizon suckers you into spending $250 over the cheaper, unlocked Moto X Pure Edition. It really is a shame, because a high-end phone that performs this well and has such fantastic durability and battery life could please a lot of customers. And outside the U.S., where this phone is sold unlocked and free of carrier bloat as the Moto X Force, I expect that it will.